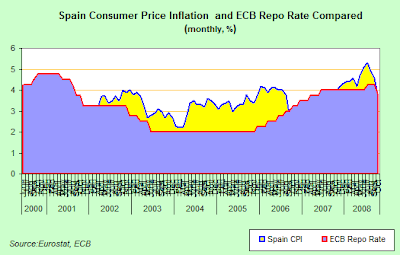 The reason for the sudden and unexpected upsurge in interest should, I would have thought, be obvious - since with 85% of Spanish mortgages being variable (and thus determined by the ECB policy rate), and Spain's economy sinking into an ever deeper pit, the impact of the coming decisions (or even the hints at possible future decisions) have entered peoples lives like never before. And this is doubly the case in an environment where - as Bloomberg inform us this morning - central bankers from across the global, from Washington, to Sydney, to Oslo are likely to take increasing account of future accelerations in asset prices in an attempt to avoid repeating policy mistakes that are presumed to have inflated two speculative bubbles in a decade, culminating in the worst financial crisis since the Great Depression. And why France you may ask? Well quite simply because the French economy is now plainly and evidently on the mend. That is the big, big news which can be gleaned from last Friday's Flash Markit PMI readings (see detailed breakdown below). Now those who regularly follow this blog will know that this seemingly unexpected leap into poll position hardly comes as a surprise to me, since I have long been arguing that the French economy would emerge as the strongest among the EU economies from the present deep recession, and some of the theoretical justification for this view can be found in this post here, while an earlier piece from Claus Vistesen in 2006 also gives an illustration of how we might conceptualise the problem. So one epoch ends, and another begins, inauspicious as the beginnings may be. To summarise briefly the argument which will be presented below, there is both good and bad news here, since this early and isolated recovery in France is bound to create difficulties of the "exit thinking" kind for policymakers over at the ECB. The most pressing of the problems will concern what to do about containing French inflation if exit dependency in Germany means that a full recovery there remains out of reach, while Italy languishes where it has always languished and Spain's seemingly intractable difficulties only increase. In other words, what will happen if - as seems obvious - the eurozone economies are in fact diverging, and not converging, and the divergence far from reducing is in fact increasing. As we will see in the charts which follow the long term decline in the GDP share of French manufacturing, which is closely associated with the steady opening of a trade deficit there, poses special threats and problems for ECB monetary policy. This long term manufacturing decline and growing external deficit are, in my opinion, the tell tale first signs of larger structural problems to come should inappropriate monetary policy be applied too hard for too long. That is to say France is well positioned to get a distortionary bubble next time round (of the exactly the kind the newly vigilant central banks should be at pains to avoid, and indeed precisely the bubble they successfully avoided last time round) unless the ECB and the French government are very clever and very agile indeed. Note - the next section is essentially a detailed breakdown of this month's Flash PMI data (the flash historically bears a reasonably good resemblance to the final data). 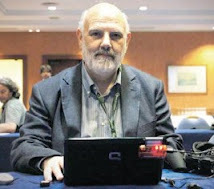 If you are not especially interested in such detail you may be well advised to glance at the charts and skip to the section - France, Not Spain, Is Different!. Flash Eurozone Composite Output Index(1) at 53.0 (51.1 in September). 22-month high. 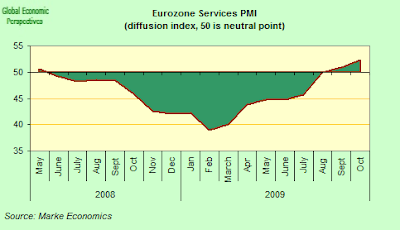 Flash Eurozone Services Business Activity Index(2) at 52.3 (50.9 in September). 20-month high. 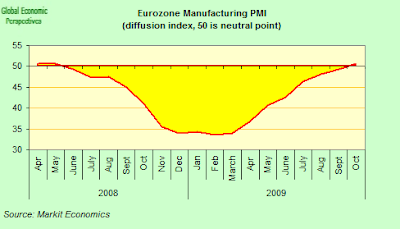 Flash Eurozone Manufacturing PMI(3) at 50.7 (49.3 in September). 18-month high. 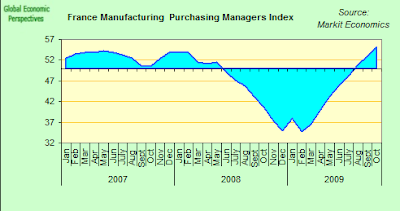 Flash Eurozone Manufacturing Output Index(4) at 54.1 (51.7 in September). 23-month high. 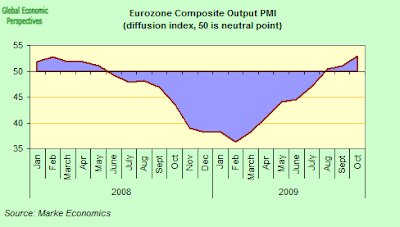 The Markit Flash Eurozone Composite Output Index, based on around 85% of normal monthly survey replies, rose from 51.1 in September to 53.0 in October, registering an increase in private sector output for the third successive month and the strongest monthly gain since December 2007. Employment in the Eurozone fell for the sixteenth successive month, even if the rate of job loss eased compared to September. The rate of decline is much slower than that seen in the spring but remains high by historical standards. Both manufacturing and services saw reduced rates of job losses, though the former continued to see the sharper rate of job shedding, despite seeing the smallest cut in headcounts for a year. Growth was driven primarily by manufacturing, where output rose for the third month running and new orders showed the strongest gain since August 2007. Despite the recent strength of the euro, new export orders showed the largest rise since January 2008, but the rate of growth remained very subdued. Activity in the Eurozone services sector meanwhile rose for the second month, expanding at the sharpest rate since February of last year, though the rate of increase remained modest and continued to trail that of manufacturing. 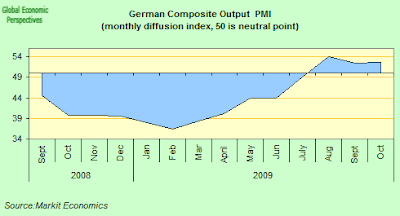 Flash Germany Composite Output Index(1) at 52.6 (52.4 in September), 2-month high. 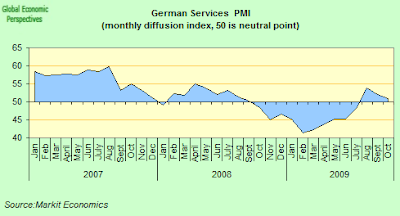 Flash Germany Services Activity Index(2) at 50.9 (52.1 in September), 3-month low. 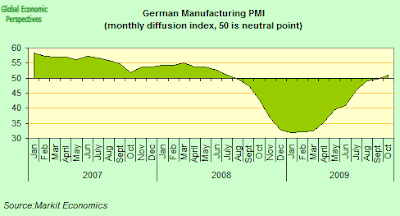 Flash Germany Manufacturing PMI(3) at 51.1 (49.6 in September), 16-month high. Flash Germany Manufacturing Output Index(4) at 54.9 (52.8 in September), 17-month high. Output levels in the German private sector economy continued to expand in October, led by the strongest rise in manufacturing production for seventeen months. Service sector business activity also increased again, but at the slowest rate in the current three-month period of growth. The seasonally adjusted Markit Flash Germany Composite Output Index, which is based on around 85% of normal monthly survey replies, rose fractionally from 52.4 in September to 52.6. The index has now registered above the 50.0 no-change mark for three consecutive months, yet the rate of expansion has remained extremely modest. Signs of excess capacity in the German economy persisted in October, despite solid rises in output and new business. Latest data indicated a further drop in backlogs of work and continued job shedding among private sector companies. Reduced staffing numbers were recorded in both the manufacturing and service sectors, primarily reflecting workforce restructuring following sharp declines in new work at the start of the year. Some firms also commented on the need to cut costs as margins remained under pressure in October. Average prices charged by private sector firms in Germany were reduced for a twelfth month running and again at a faster pace than input costs. Manufactures and service providers both signalled marked declines in average output charges. Panellists generally attributed this to strong market competition and a resultant lack of pricing power. Meanwhile, input costs dropped only marginally in October and at the slowest rate in the current twelve-month period of decline. Data indicated that lower costs were largely confined to the manufacturing sector. Those reporting a reduction in purchasing costs frequently commented that subdued demand for raw materials had contributed to successful price negotiations with suppliers. In the manufacturing sector, higher levels of private sector business activity were driven by a further solid expansion of incoming new work. The latest increase in new business was the strongest for a year-and-a-half. The manufacturing sector continued to lead the way, as new order volumes rose at the fastest pace since August 2007. This was supported by a robust increase in new export orders, with a number of firms pointing to stronger demand from China and Eastern Europe. Meanwhile, service providers recorded only a modest improvement in new business levels in October. Anecdotal evidence suggested that clients remained hesitant to commit to new expenditure, leading to only a gradual recovery in demand. Nonetheless, service sector companies were confident regarding the twelve-month outlook for activity at their units, with 32% expecting a rise against just 18% thatforecast a decline. 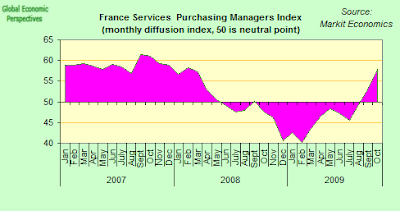 What stands out in this months data, however, is the performance of the French economy. 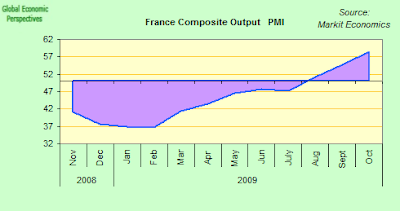 The output Index, which is based on around 85% of normal monthly survey replies, indicated that growth of the French private sector was sustained into a third successive month – and at an accelerated rate. Climbing to 58.4, from 54.8 in September, the headline index indicated that growth accelerated markedly to reach its steepest in nearly three years. Higher output was again broad-based, with both manufacturing and service sectors registering strong growth. Manufacturing output increased for a fourth successive month and at the steepest pace since May 2006. 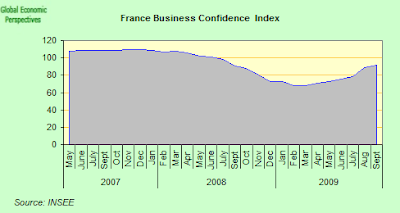 Outstanding business in the French private sector rose in October for a second successive month. In a sign of emerging capacity pressures – particularly in manufacturing – overall growth was the steepest in 19 months. Despite rising backlogs, French private sector companies continued to reduce employment in October. The rate of contraction remained historically marked, with job losses most acute in services (job losses in manufacturing were the slowest for 14 months). Cost cutting and restructuring were noted by panellists. 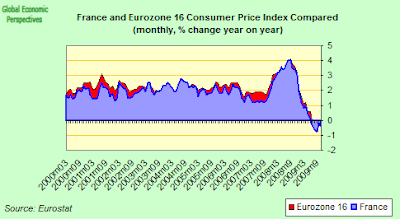 Input prices continued to fall in October, extending the current period of deflation to 12 months. However, the rate at which costs declined was only modest, with manufacturing registering a net rise in their purchase prices. Inflation here was linked to higher steel and oil-related product prices. Strong competitive pressures led to another reduction in output prices during October, with the rate of decline remaining sharp. Output charges have now fallen throughout the past year. Services activity rose at a slower pace than manufacturing output, but still - at a level of 57.8 - registered a strong gain, indeed the rate of expansion was the best since February 2008.
i) much better lending regulation than some of the bubble economies in the key years. 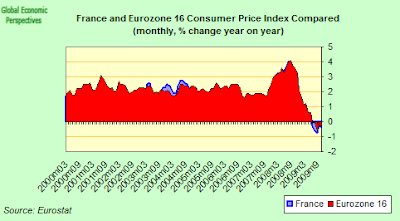 France was also the only eurozone country who really had a more or less approriate interest rate applied by the ECB during the critical years from 2001 to 2007, so there are less structural distortions in the economy (not NONE, but less). On the other hand, as far as France's fiscal budget trajectory goes there are both long term structural and short term fine-tuning deficit issues to think about. The deficit has nearly doubled during the first eight months of this year (widening from EUR 67.6bn in 2008 to EUR 127.6bn in 2009), and although the French budget normally has a surplus in the last four months of the year, this is unlikely to be the case this year, so the deficit will undoubtedly widen further possibly reaching 7.3% of GDP (or 8.2% including social security). The main reason for the increasing deficit is evident - the collapse on the revenue side. VAT income, for example, fell by EUR 10.4bn, or 12.0%, over the first eight months of the year. Overall total income fell 23.1% during the first eight months of the fiscal year, and although the pace of decline may slow over the whole year the government still expect the 2009 deficit to reach EUR 141bn for the central government and EUR 158bn (or 8.2% of GDP) for the government spending in general (including social security). Since the various French stimulus packages only amount to an estimated 1.2% of GDP this means that the so called automatic stabilisers (i.e. the “natural” drift of the deficit on a no policy change assumption) account for 3.6 percentage points of the 4.8% of GDP increase in the general government deficit from 2008. 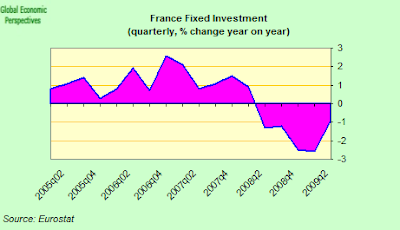 Looking forward, France's 2010 budget is based on a reasonably cautious economic forecast of 0.75% growth, following something like a 2.5% - 2.25% contraction in 2009. Despite this cautious approach there is still a considerable degree of uncertainty about the behaviour of tax income in the wake of the recession, and this is why the budget deficit is also expected to grow. On the inflation side the government forecasts an inflation rate of 1.2% in 2010, following 0.4% in 2009, but since the growth forecast is conservative the inflation outlook will be subject to upside risk, which is why I think 1.3% to 1.5% is a much more likely band. Part of the deficit will naturally disappear as tax revenues recover. However, due to structural biases in the cost components of the budget there is still plenty of upside potential in debt to GDP moving forward - the latest forecast is for around 91% in 2013/14 - and substantial action will still be needed to lower the deficit in the years ahead. 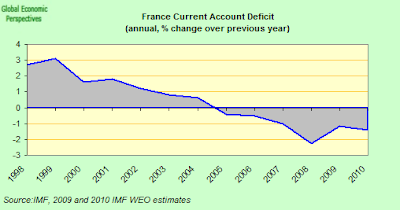 The public deficit is currently expected to fall in 2011 (from 8.5% in 2010 to 7.0%), but the numbers involved are still very large, and France is one of the best case scenarios, so this really begin to give us a picture of the severity of the downturn we have just been through. And of course we are by no means out of the woods yet. 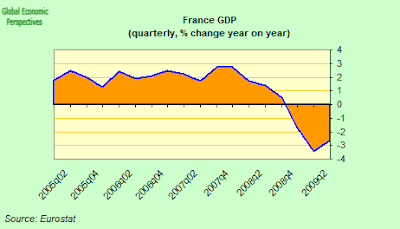 French GDP surprised positively with a 0.3% quarterly gain in the second quarter. 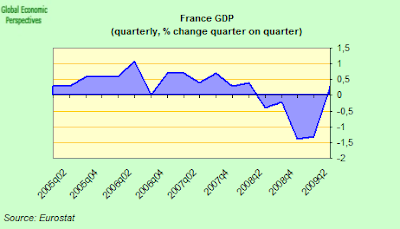 Given the data we are seeing, a forecast of 0.2% quarterly growth for both the third and final quarters would not seem to be an unreasonable expectation at this point, which would mean the French economy would shrink by something under 2.5% in 2009, well below the average Eurozone contraction rate. All the data we have seen for August and September confirm the view that the French economic environment is improving considerably, although the presence of continuing weak spots (especially on the employment front) mean real GDP growth will probably remain modest during the rest of this year. The monthly survey of business sentiment was up sharply in September (at 92 against 89 in July). This indicator has moved even further away from its all-time low (68 in February and March), while remaining far below its long-run average. Order books are also picking up -59 showing in September versus -68 in July. Export order books are also looking better too at -65 versus -66 in July. The consumer goods component in industrial goods orders improved markedly in September (-32 versus -37 for total orders, and -39 versus -33 for export orders), which indicates that domestic consumption spending is likely to be less depressed than it was in July and August. Likewise "capital goods" orders showed a slight improvement in September ( -68 for total and -70 for export orders versus -69 and -73 in July). If this improvement continues in October the ongoing deterioration in investment spending (see chart below) might be drawing to a close. This improvement is also corroborated by the surge in the October manufacturing PMI. Activity in services also picked up again sharply in October as did activity in the construction sector - hence the interannual drop in GDP should be significantly under the Q2 level of 2.6% by the time we reach the end of the year. 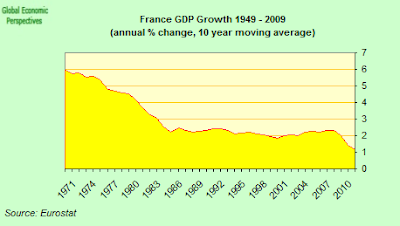 It is also worth remembering that long term growth in French GDP has really been remarkably constant in recent times (see ten year moving everage chart below), at just a little over 2%. Previously this might have been considered rather low by many commentators, but in the light of what we have just seen happen to the "out-performers" the French result looks reasonably solid and sustainable, which means we could expect a pretty solid "V" shaped rebound in 2010 (especially during the second half) and the big danger is that excessively loose monetary conditions for the Eurozone as a whole and ongoing fiscal stimulus could send the French economy shooting upwards above its long term sustainable trend. French industrial output rose more than expected in August, rising 1.8 per cent from the previous month on the back of a surge in car production, according to new data. The monthly rise contrasted with a forecast rise of 0.5 per cent from economists and was fuelled by an 11 per cent rise in production of transport equipment, including an 18.2 per cent rise in the car component. 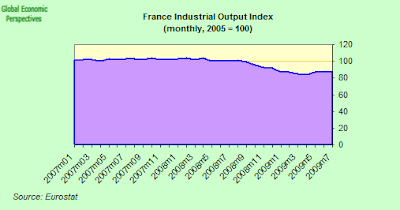 Nonetheless French industrial output remains down around 12% in comparison with a year earlier, even though - as I keep stressing - this is considerably less than the drop in most other Eurozone economies. Although the industrial output collapse has been a little less dramatic than in other eurozone countries, the rebound in France seems to remain largely in line with its peers. Industrial production in fact outpaced the GDP collapse in late 2008, so that it may now also be overstating the rebound. 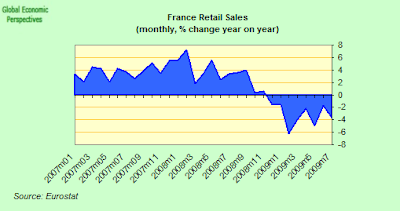 French retail sales have been falling, but not to anything like the extent we have seen elsewhere in Europe. They were down 3.75% year on year in July. 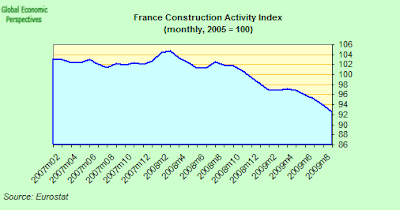 France's construction sector also seems to be on the long road to recovery, thanks to a correction in the housing sector. A combination of lower prices and very low interest rates have boosted new home sales. Housing investment dropped over the last five quarters, losing an annual 8.7%, making for the worst recession in the sector in the last thirty years. Housing affordability has now rebounded sharply thanks to the interest rate component and a sharp fall in existing home prices (down about 10% year on year) which has allowed a rebound in new home sales and a decline in the stock of new homes for sale. To get some sort of comparison France had approximately 100,000 unsold new housing units at the end of 2008, compared with over a million in Spain. This inventory has now fallen to around 80,000. 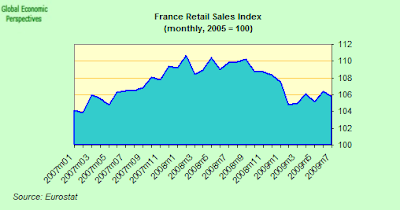 According to the latest provisional INSEE data French household spending decreased slightly in Q3 (-0.2% q/q), despite the end of quarter rebound recorded in September (up a monthly 2.3%). Real spending was up a monthly 2.3% in September, after following a 1.1% fall in July and a 1.0% drop in August - so the long march upwards in consumption is not yet that robust. In fact the stats office data show that this September rise was mainly due to a surge in car sales. In line with a sharp rebound of new vehicles registrations (up 7.3% on the month), car sales were up by 10.2% in September over August, offsetting the falls recorded from the beginning of the quarter. Consequently, car sales were roughly flat in Q3 (down 0.1% over Q2), following a 5.7% quarterly rise in Q2. On the other hand, general sales were down by a quarterly 2.5% in Q3, while "other manufactured products" sales, that represent more than 40% of the consumption, remain sluggish, rising by a quarterly 0.1% in Q3 following a drop of 0.1% in Q2. So at the end of the day the data tend to confirm the idea that the evolution of total spending has been largely dependant on car sales and government incentive scheme since the beginning of the year. Despite the rebound recorded in September, the stabilisation of car sales in Q3 resulted in a slight decrease of overall spending, that was down by 0.2% in Q3 when compared with Q2, following a 0.7% rise in Q2. 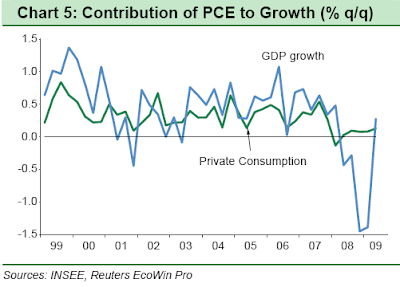 As can be seen in the chart below (which was prepared by Dominique Barbet and Martine Borde for PNB Paribas) even while headline GDP shot down at the end of 2008 Private Consumption Expenditure (PCE) recovered rapidly due to the impact of the stimulus programme. 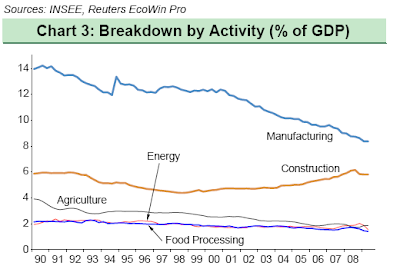 And as we can see in the following chart, while consumption in France has proved quite robust over the years, the manufacturing share in GDP has been declining steadily. This is, of course, quite a worrying trend. 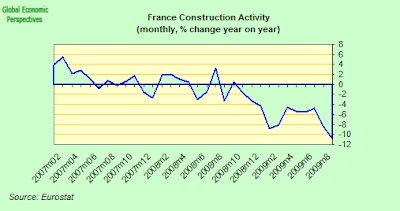 We can also see quite a clear indication of why France doesn't have the kind of problems Ireland and Spain have when we look at the construction share, since while this rose slightly between 2004 and 2007, at around 6% of GDP it was a far cry from the Irish and Spanish levels (which were twice as big at around 12%), and hence the French economy now has far less difficulty sweating down the capacity and inventory overhang. 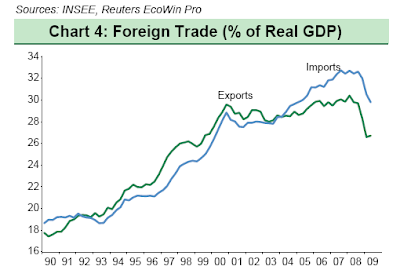 And lastly (in this set of charts) we can see that while the trade share in French GDP has been growing steadily since the early 1990s, this increase in trade openness has also been accompanied by an increase in import penetration, and a steady widening of the trade deficit. It is this problem which could well turn critical during the next upturn if corrective measures are not taken in time. 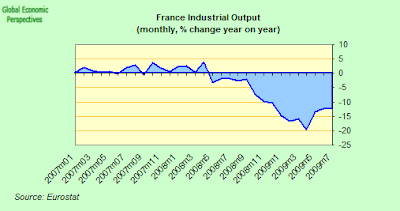 Evidently French exports remain weak, and can in no way explain the recent recovery in industrial pooduction. The export rebound which took place in July was short-lived, and the narrowing of the deficit we have seen between 2008 and 2009 has primarily been due to lower crude oil prices. On the other hand euro appreciation is not the main reason for the poor export performance, as the deficit is wider with eurozone trading partners than with others. The drop in imports is adequately explained by the fall in domestic demand, and is not a sign of improved domestic competitiveness. At the same time the non-goods surplus has narrowed significantly, because of smaller surplus on services and the decline of the surplus on the income account. Thus while the current account deficit has narrowed somewhat, and is expected to stay contained over the next twelve months, the risk of a sharp widening in the years to come is clear enough. 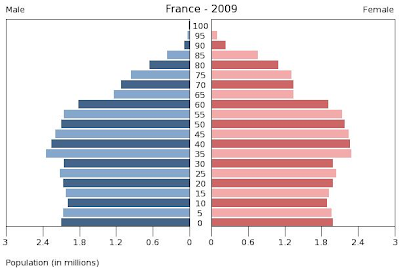 Basically, a large part of the differential performance between France and Germany can be explained by comparing the two population pyramids. 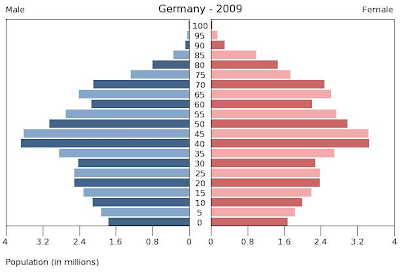 France has an annual population growth rate of around 0.5% while Germany has a population SHRINKAGE rate of around 0.1%. France has a total fertility rate of around 2.0, while the German one is around 1.35.
a) French domestic consumption is far more stable and dynamic (I would say that this by now should have attained the status of being a "self evident truth"). b) the French government debt to GDP problem, while being important, can be corrected over a longer period than the German one, since France is not ageing so rapidly. This does NOT mean that France should not be doing anything to put its house in order, clearly the underlying structural problems in the public deficit situation - health and pensions - need addressing, but France has more margin of manoeuvre to do this. The important thing is that the French administration do not put this off and off until they reach the same state of mess that the Germans are now in. France should, nonetheless be given credit for having done her homework on fertility. Basically one look at the unstable shape of this pyramid should give us plenty of course for concern about Germany's future. "However, after several years of budgetary vigour Germany's public finances are now in far better shape than those of France, while the German government has secured approval of a law establishing the principle of a balanced budget in the German constitution. A persistent, large-scale asymmetry in the fiscal policies of the euro area's two largest member states could become a significant source of tension in the period ahead." 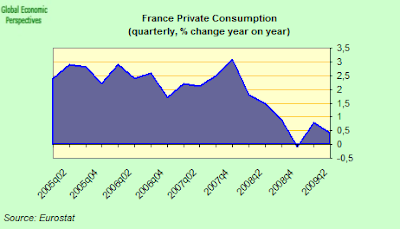 a) German trend growth (under 1%) is now significantly below French trend growth (around 2%). b) German structural deficits related to ageing are going to be much more serious in the coming decade. And signs of the problems this is creating are to be found all over the place. Only last week the two parties in the new German government coalition were toying with the idea of setting up a €60bn fund whose explicit objective was to cover expected welfare-system deficits over the next four years. That would have raised new government borrowing for 2009 from just under €50bn to over €90bn – but would have had the advantage that it would have made it easier for the government to fulfil a constitutional amendment passed this year, which obliges the federal and state governments to reduce their deficits year by year starting in 2011. Basically, what is the value of having a constitutional ammendment to limit the deficit, if the very next minute you start to look for ways to get around it in order to meet the needs of short term expediency? Rainer Brüderle, one of the FDP’s economics experts, on the other hand denied the plan was mere "trickery” and noted that special funds had been used before to finance the extraordinary burdens of German unification and the recent bank bail-out fund. The point here is not to get bogged down in the ins and outs of fiscal rectitude, but to see the stark and evident fact that the German government far from having, as the EIU puts it, secured a law which means their fiscal position is in better shape than that of French faces stark and difficult choices in carrying through what will remain a knife edged balancing act over the years to come. The background here is that in June 2009, Germany introduced ammended its constitution by passing a law that will only allow federal deficits of up to 0.35% of GDP during normal times starting in 2016. 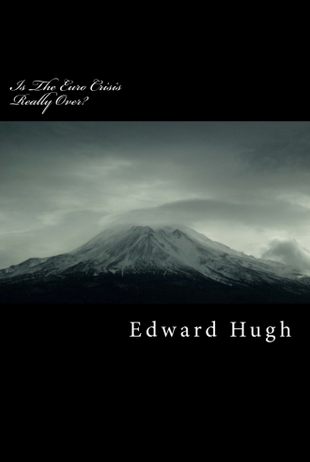 After 2020, regional state deficits are to be abolished, while parliament can only suspend the rule in the event of “natural catastrophes or other unusual emergency situations." The very presence of this law should give us an indication of just how critical German public finances may become. In order to comply with the law, Germany will have to implement spending cuts or raise taxes starting in 2011 regardless of whether they have weaker tax revenue, rising welfare bills, or need more stimulus measures and spending for bank bailouts. In the end the proposal to borrow extra money this year was ditched even though a 24 billion- euro tax cut programme aimed at low and mid-level earners was adopted. Basically the "creative accounting" proposal might well have satisfied the needs of the new constitutional law, but they would not have helped with the excess deficit criteria applied by Eurostat and the EU Commission, since when the German social security system (which - remember - forms part of the government sector according to the Eurostat rules) spent the money and actually ran the deficits in 2011 or 2012, this would have been recorded as a deficit for the German public sector according to the Eurostat rules no matter when the money was borrowed. So the new government now adding tax cuts to the earlier deficits is very likely to put it in breach of the EU's Stability and Growth Pact concept of a 3-percent limit and will in all likelihood put Berlin in conflict with Brussels. According to the most recent government forecast Germany GDP will now contract by 5% in 2009 (as compared to around minus 2.5% in France) and will the grow by about 1.2% next year. As a result net new borrowing is forecast by the latest government budget calculations to almost double next year to 86.1 billion euros from a record 47.6 billion euros this year. In an interview with Financial Times Deutschland, Jurgen von Hagen from the Institute for International Economics put it like this "Germany’s fiscal policy has been totally misguided, as it persistently ignored the inter-relationship between deficits and growth. Debt ceilings, such as the recently agreed constitutional change, do not work as they are too mechanistic, and lead to policy mistakes." Germany's debt to GDP is estimated at 79% for 2009 and 87% for 2010, up from 67% in 2008, according to the IMF (World Economic Outlook) and on October 7, 2009, the European Commission issued a formal warning about Germany's large deficit - normally the initial step before opening an excessive deficit procedure. 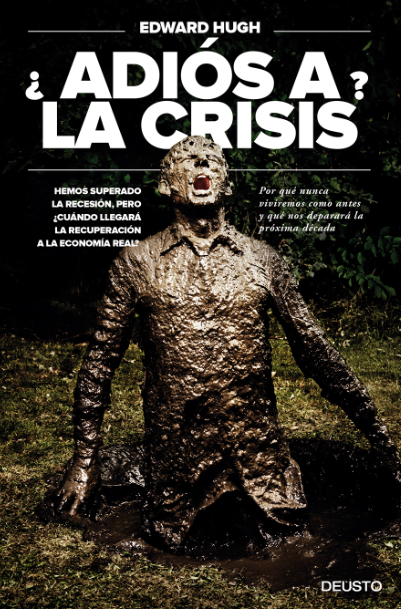 a) suggested that the whole covergence idea (that all eurozone economies where converging to a common profile) did not offer an adequate description of the actually economic processes we can see on the ground, and that, in fact, the economic profile varies widely from one country to another. It is more a question of "vive la difference"
b) examined how, in terms of the Eurozone's two largest economies - France and Germany - the paths are very divergent. Germany has an export dependent economy, which has been severely savaged by the present deep recession, and recovery is fragile (Axel Weber's expression) and will remain so until other economies recover and export growth can resume. c) seen that while both countries suffer from important structural problems in the public finances, with debt to GDP in both cases being around 90% of GDP in 2011, in fact the country which is likely to face the more extreme difficulties over the coming decade is likely to be Germany due to the more rapid population ageing which is taking place there and the excessive dependency on exports which this produces. d) spelt out how the ECB may well now be facing its "finest hour", as it has to rise to the challenge of adapting a one size fits all interest rate policy to a world where one size evidently doesn't fit all, and where the danger of fuelling an excessive consumer boom in one country (France) will have to be set against the risk of sending the banking system of into meltdown in another (Spain). This is clearly the banking equivalent of being stuck between a rock and a hard place new tools and new thinking will need to be developed if we are to finally steer that path between the insatiable appetite of Scylla and the never ending thirst of Charybdis. Finally, just to make all of this very concrete, lets take a look at the different rates of new credit creation as between French and Spanish households - courtesy again of one of those very useful charts prepared by Dominique Barbet and Martine Borde for PNB Paribas). 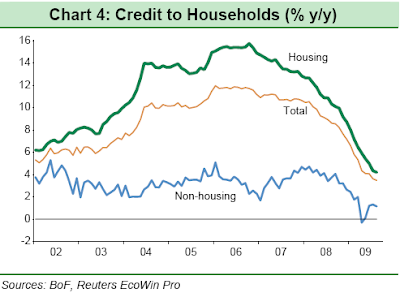 As we can see in the following chart, annual growth in total household credit in France never went about around 11% to 12% during the boom, and has now not fallen much below 3% during the slump. In Spain in contrast, the annual rate of new household credit creation was more like 20% during the boom years, and this has steadily dropped since the start of 2007, and finally went negative in August (latest data). It is of course still falling. 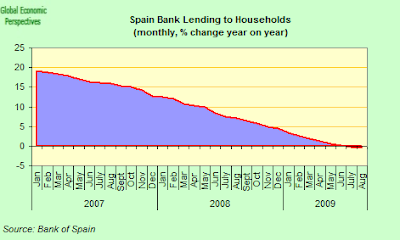 And this is the danger, that consumer borrowing in Spain remains weak (even as exports are lacklustre), while in France the excessively loose monetary conditions send consumers off to the banks to borrow and then on to the shops to spend.